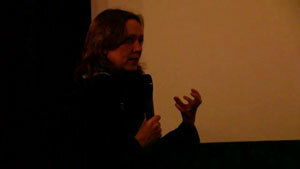 Stefanie Schulte Strathaus presents the history of the Arsenal Institute for Film and Video Art, its beginnings as an institution, and the need for such an institution in Berlin. Several issues are raised in discussion about the politics of maintaining a film archive, especially in relation to its own collection and to the city that houses it. Two projects are highlighted, The Living Archive and The Visionary Archive, collaborations that have resulted from projects with a number of practitioners and other archives from around the world. Synthesis Arsenal Institute for Film and Video Art • Berlin Film Festival • Archive of 10,000 films • The films in Arsenal’s archive have only one purpose: to be shown • Anthology Film Archives in New York • Ausklappen...	Arsenal Institute for Film and Video Art • Berlin Film Festival • Archive of 10,000 films • The films in Arsenal’s archive have only one purpose: to be shown • Anthology Film Archives in New York • Started as association called Freunde der Deutsche Kinemathek • No alternative cinema in Germany in the 60s • An important aspect of Arsenal was the combination of film history with contemporary film practice • Lionel Rogosim – film Come Back Africa: the first film in the archive, the basis of the collection and the beginning of distribution • Michael Verhoeven – film OK • The start of the Forum of Young Cinema • International films first collected at the initiative of the festival to subtitle them • Films sent from countries under military dictatorships • What to do with old print vs. DVD? • Old prints get vinegar syndrome • Too costly to digitise everything • Films are not categorised in the collection • The Living Archive project • Many of the films exist only in this collection • Archive as a practice: archiving films, curating films, restoring films, showing films • Opening an archive is not threatening an archive • Avi Mograbi and Angela Melitopoulos in The Living Archive project • The Visionary Archive • Attempting to run an institution without being an institution • Erika and Ulrich Gregor are still part of Arsenal • Preserving the memory of the institution itself • The Living Archive attracted partners from other countries • Filmmaker Gadalla Gubara • Guinea Bissau and Egypt forming film archives • The Visionary Archive works with these emerging archives • Restoration also part of the institution’s work	Short biography Stefanie Schulte Strathaus, film and video curator, co-director of the Arsenal Institute for Film and Video Art, member of the selection committee of the Berlinale Forum, Ausklappen...	Stefanie Schulte Strathaus, film and video curator, co-director of the Arsenal Institute for Film and Video Art, member of the selection committee of the Berlinale Forum, and founding director of Forum Expanded, a section of the Berlin International Film Festival that negotiates the boundaries of cinema. Her curatorial work comprises numerous film programmes, retrospectives, and exhibitions, among them The Living Archive – Archive Work as a Contemporary Artistic and Curatorial Practice. Stefanie Schulte Strathaus stellt die Geschichte des Arsenal – Institut für Film und Videokunst vor und spricht über die Notwendigkeit einer solchen Institution in Berlin. Die Diskussion berührt folgende Aspekte: die politischen Rahmenbedingungen für die Pflege eines Filmarchivs, die Bedeutung der eigenen Filmsammlung und die Rolle des Archivs für die Stadt Berlin. Zwei Projekte werden insbesondere erwähnt, The Living Archive und The Visionary Archive; beide involvieren Beteiligte und verschiedene andere Archive weltweit. Synthese Arsenal Institute for Film and Video Art • Berlinale • Archiv mit 10,000 Filmen • Die Filme im Archiv des Arsenal haben nur einen einzigen Zweck: Gezeigt zu werden • Anthology Film Archives in New York • Ausklappen...	Arsenal Institute for Film and Video Art • Berlinale • Archiv mit 10,000 Filmen • Die Filme im Archiv des Arsenal haben nur einen einzigen Zweck: Gezeigt zu werden • Anthology Film Archives in New York • Entwickelte sich aus einem Verband namens Freunde der Deutsche Kinemathek • In den 1960er Jahren gab es kein alternatives Kino in Deutschland • Wichtiger Aspekt des Arsenal war die Kombination aus Filmgeschichte mit zeitgenössischen Filmpraktiken • Lionel Rogosim – Film Come Back Africa: Erster Film im Archiv, Grundlage der Sammlung und Ausgangspunkt des Vertriebs • Michael Verhoeven – Film OK • Beginn des Forum of Young Cinema • Internationale Filme wurden zuerst auf Initiative des Festivals gesammelt um sie mit Untertiteln zu versehen • Filme aus Ländern mit Militärzensur erhalten • Was tun mit alten Filmrollen vs. DVD? • Alte Filme bekommen Essig-Syndrom • Zu kostspielig alles zu digitalisieren • Filme in der Sammlung sind nicht kategorisiert • The Living Archive Projekt • Viele Filme existieren nur in der Sammlung • Archive als Praxis: Filme archivieren, kuratieren, restaurieren und zeigen • Ein Archiv eröffnen ist keine Bedrohung für Archive • Avi Mograbi und Angela Melitopoulos im The Living Archive Projekt • The Visionary Archive • Versuch eine Institution zu führen ohne eine Institution zu sein • Erika und Ulrich Gregor sind immer noch Teil des Arsenal • Das Andenken an die Einrichtung selbst erhalten • The Living Archive lockt Partner aus anderen Ländern an • Filmemacher Gadalla Gubara • Guinea Bissau und Ägypten begründen Filmarchive • The Visionary Archive arbeitet mit diesen entstehenden Archiven • Restauration ist auch Teil der Arbeit des Archivs	Kurzbiografie Stefanie Schulte Strathaus, Film- und Videokuratorin, Co-Direktorin des Arsenal - Institut für Film- und Videokunst, Mitglied des Auswahlkommittees des Berlinale Forums Ausklappen...	Stefanie Schulte Strathaus, Film- und Videokuratorin, Co-Direktorin des Arsenal - Institut für Film- und Videokunst, Mitglied des Auswahlkommittees des Berlinale Forums und Gründerin und Leiterin des Forum Expanded, einem Bereich des Berlin International Film Festivals, der die Grenzen des Kinos auslotet. Ihre kuratorische Arbeit umfasst zahlreiche Filmprogramme, Retrospektiven und Ausstellungen, unter anderem The Living Archive – Archive Work as a Contemporary Artistic and Curatorial Practice. Bernd Scherer presents a brief history of the Haus der Kulturen der Welt (HKW) and speaks of the different projects that the HKW is producing in collaboration with curators, artists, and other practitioners from around the world. The discussion focuses on the role that the HKW has played and how it is reconfiguring itself for the future. Synthesis HKW was a gift from the United States to the city of Berlin in 1957 • A symbolic locale in Cold War Berlin • First sign of the West when crossing over from East Berlin • Ausklappen...	HKW was a gift from the United States to the city of Berlin in 1957 • A symbolic locale in Cold War Berlin • First sign of the West when crossing over from East Berlin • Criticism that the HKW was a realm or space defined by the ‘exotic’ • It also played a transmitter role for quite a number of intellectuals and artists • Post-colonial discourse – Homi K. Bhabha, Okwui Enwezor, the Short Century • The Black Atlantic with Paul Gilroy • Third phase of the HKW seeks to encourage an interaction between local and global discourse • What is art, and what are art institutions doing? • The reconceptualisation of the HKW • Global Prayers – working together with academics, artists, and cultural and social activists in cities such as Berlin, Rio de Janeiro, Lagos, Beirut, Istanbul, and Mumbai • Processes of modernisation and secularisation involve removing religion from the picture • 80 researchers in these cities, with different artists • Artist Aernout Mik • The border between scientific and artistic approaches • German Research Foundation (DFG) starting to support workshops in order to develop a conceptual approach to these issues • Whole Earth • How counterculture transforms into big business • After Year Zero • Cultural and political movements in the non-western world	Short biography Bernd Scherer, director of the Haus der Kulturen der Welt (HKW), holds a doctoral degree in philosophy from the Universität des Saarlandes Ausklappen...	Bernd Scherer, director of the Haus der Kulturen der Welt (HKW), holds a doctoral degree in philosophy from the Universität des Saarlandes and is the author of several publications focusing on aesthetics and international cultural exchange. 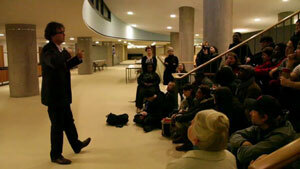 Previously, he headed the Department of Humanities and Culture at the HKW and has also served as its Deputy Director. He served as Director of the Goethe Institute Mexico from 1999 through 2004 and subsequently as Director of the Arts Department at the Goethe Institute’s headquarters in Munich. Bernd Scherer spricht über die Geschichte des Haus der Kulturen der Welt (HKW) und verschiedene Projekte die das HKW in Zusammenarbeit mit Kuratoren, Künstlern und anderen internationalen Teilnehmern produziert. Die Diskussion konzentriert sich auf die Rolle des HKW in der Vergangenheit und wo es sich zukünftig sieht. Synthese HKW war ein Geschenk der USA an die Stadt Berlin im Jahr 1957 • Ein symbolischer Ort im Berlin des kalten Krieges • Erstes Zeichen des Westens wenn man aus Ostberlin kam • Ausklappen...	HKW war ein Geschenk der USA an die Stadt Berlin im Jahr 1957 • Ein symbolischer Ort im Berlin des kalten Krieges • Erstes Zeichen des Westens wenn man aus Ostberlin kam • Kritik am HKW als Ort, der auf das Exotische setzt • Spielte eine Vermittlerrolle für Intellektuelle und Künstler • Postkolonialer Diskurs – Homi K. Bhabha, Okwui Enwezor • The Short Century • The Black Atlantic mit Paul Gilroy • Dritte Phase des HKW hat zum Ziel, einen Austausch zwischen dem Globalen und dem Lokalen zu ermöglichen • Was ist Kunst und was tun Kunsteinrichtungen? • Global Prayers – Zusammenarbeit mit Wissenschaftlern, Künstlern sowie kulturellen und sozialen Aktivisten in Städten wie Berlin, Rio de Janeiro, Lagos, Beirut, Istanbul und Mumbai • Modernisierungsprozesse und Säkularisierung haben zu Folge, dass die Religion aus dem Blickwinkel verschwindet • 80 Forscher und Künstler in diesen Städten • Künstler Aernout Mik • Die Grenze zwischen wissenschaftlichem und künstlerischem Ansatz • Deutsche Forschungsgemeinschaft beginnt Workshops zu unterstützen um einen konzeptuellen Ansatz zu diesen Fragen zu entwickeln • Whole Earth • Wie verwandelt sich eine kulturelle Opposition in "Big Business"?• After Year Zero • Kulturelle und politische Bewegungen außerhalb der westlichen Welt	Kurzbiografie Bernd Scherer, Leiter des Haus der Kulturen der Welt erhielt seinen Doktor in Philosophie von der Universität des Saarlandes Ausklappen...	Bernd Scherer, Leiter des Haus der Kulturen der Welt erhielt seinen Doktor in Philosophie von der Universität des Saarlandes und ist Autor mehrerer Publikationen zu Ästhetik und internationalem kulturellen Austausch. Zuvor leitete er die Abteilung für Geisteswissenschaften und Kultur am HKW und war stellvertretender Leiter des Hauses. Von 1999 bis 2004 leitete er das Goethe Institut Mexiko und arbeitete danach als Leiter der Abteilung für Kunst in der Zentrale des Goethe-Institutes in München. Doreen Mende presents her work related to the Travelling Communiqué project in collaboration with the Haus der Kulturen der Welt (HKW) and the Museum of Yugoslav History. This work focuses on photo archives, including the presidential press service archive of Tito. The project, which explores the Yugoslav perspective on the Non-Aligned Movement, raises many issues, such as globalisation, politics of inclusion, the use of images in political movements, and colonialism. Synthesis Travelling Communiqué • HKW • Long-term, collaborative research project • Artist Milica Tomić • Museum of Yugoslav History • The presidential press service archive of Tito • The Otolith Group • Ausklappen...	Travelling Communiqué • HKW • Long term, collaborative research project • Artist Milica Tomic • Museum of Yugoslav History • The presidential press service archive of Tito • The Otolith Group • The Dutch Art Institute • The Non-Aligned Movement, its first conference in Belgrade from September 1–5, 1961 • Why deal with this topic in an era of globalisation • Politics of inclusion by a condition of permanent war • Tito’s affinity with images • Tito’s construction of a cinema in the Museum of Yugoslav History • Image production a crucial instrument of militant cinema vs. an instrument to continue an independence movement • How can we make use of this archival material in the context of the HKW? • Interventions into the historical material • What could be the Ethiopian horizon in the Non-Aligned Movement? • The first conference of the African Union in 1963 • The film Blood Is Not Fresh Water – suggesting a way of reading history through different culture rituals • Different concepts of history • The document as a historical indication of a moment • The inner split that appears or emerges in the figure of Tito • The ambivalent or paradoxical situation between independence movement and structure of the state • The impact colonialism had on the particular countries on the African continent • We are not working only with the archive presidential press service • Relating to these historical moments via images, speeches, and films • The Non-Aligned Movement still going today – hosted by Iran • This power or force is not like the master plan for a new world order or for another universalism	Short biography Doreen Mende, curator interested in theoretical and practical issues of exhibiting with regard to space and geopolitics. Ausklappen...	Doreen Mende, curator interested in theoretical and practical issues of exhibiting with regard to space and geopolitics. In 2011, she was a fellow of the Arab Image Foundation in Beirut. She completed her practice-based PhD at Goldsmiths in 2013. She is co-founder of the publication series Displayer at HfG/ZKM in Karlsruhe and currently teaches at the Dutch Art Institute. With Milica Tomic, Armin Linke, and other authors, she is currently working on the project Travelling Communiqué, which discusses the topicalities of the Yugoslav Presidential Press Service / Photo Section in Belgrade during Tito’s presidency from 1948 to 1980. 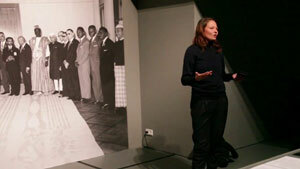 Doreen Mende präsentiert ihre Arbeit die im Rahmen des Travelling Communiqué Projektes in Zusammenarbeit mit dem Haus der Kulturen der Welt (HKW) und dem Museum für Jugoslawische Geschichte entstanden ist. Diese Arbeit beschäftigt sich mit Fotoarchiven, so auch dem präsidentiellen Pressedienstarchiv unter Tito. Das Projekt untersucht die jugoslawische Perspektive der Bewegung der blockfreien Staaten und stellt Fragen u.a. zu Globalisierung, Inklusionspolitik, der Verwendung von Bildern in politischen Bewegungen und zu Kolonialismus. Synthese Travelling Communiqué • HKW • Auf lange Zeit angelegtes kollaboratives Forschungsprojekt • Künstlerin Milica Tomić • Museum of Yugoslav History • Das präsidentielle Pressebildarchiv unter Tito • The Otolith Group • Ausklappen...	Travelling Communiqué • HKW • Auf lange Zeit angelegtes kollaboratives Forschungsprojekt • Künstlerin Milica Tomic • Museum of Yugoslav History • Das präsidentielle Pressebildarchiv unter Tito • The Otolith Group • The Dutch Art Institute • Bewegung der blockfreien Staaten, sowie dessen erste Konferenz in Belgrad vom 1. bis 5. September 1961 • Warum sollte man sich mit diesem Thema während einer Zeit der Globalisierung befassen? • Politik der Inklusion durch einen permanenten Kriegszustand • Titos Affinität zu Bildern • Titos Bau eines Kinos im Museum für jugoslawische Geschichte • Bildproduktion als wichtiges Element eines militanten Kinos vs. als ein Instrument mit dem eine unabhängige Bewegung fortgeführt wird • Wie können wir dieses Archivmaterial im Rahmen des HWK nutzen? • Interventionen im historischen Material • Was könnte der äthiopische Horizon innerhalb der Bewegung der blockfreien Staaten sein? • Die erste Konferenz der Afrikanischen Union im Jahr 1963 • Der Film Blood Is Not Fresh Water – Vorschlag einer historischen Lesart durch kulturspezifische Rituale • Verschiedene Geschichtskonzepte • Dokumente als historische Indikatoren eines Moments • Die innere Zerrissenheit, die sich in der Figur von Tito zeigt • Die Ambivalenz oder paradoxe Situation zwischen unabhängigen Bewegungen und der staatlicher Struktur • Der Einfluss des Kolonialismus auf spezifische Länder des afrikanischen Kontinentes • Wir arbeiten nicht ausschließlich mit dem Archiv des präsidentiellen Pressedienstes • Sich auf diese historischen Momente durch Bilder, Rede und Film beziehen • Die Bewegung der blockfreien Staaten existiert auch heute noch – mit dem Gastgeber Iran • Diese Macht oder Kraft ist nicht gleichsetzbar mit einem Masterplan für eine neue Weltordnung oder einen anderen Universalismus	Kurzbiografie Doreen Mende, Kuratorin, interessiert sich für praktische und theoretische Ausstellungsaspekte mit Fokus auf Raum und Geopolitik. Ausklappen...	Doreen Mende, Kuratorin, interessiert sich für praktische und theoretische Ausstellungsaspekte mit Fokus auf Raum und Geopolitik. Im Jahr 2011 war sie Fellow der Arab Image Foundation in Beirut. Im Jahr 2013 schloss sie einen praktischen PhD am Goldsmiths College London ab. Sie ist Mitbegründerin der Publikationsreihe Displayer an der HfG/ZKM in Karlsruhe und unterrichtet momentan am Dutch Art Institute. Aktuell arbeitet sie mit Milica Tomic, Armin Linke und anderen Autoren am Projekt Travelling Communiqué, das sich mit der Aktualität vom Bilddienst des Jugoslawischen Präsidentiellen Pressedienstes in Belgrad während Titos Präsidentschaftszeit von 1948 bis 1980 auseinandersetzt. Aykan Safoğlu: Off-White Tulips (Kırık Beyaz Laleler), 2013, HD, Colour, 24´, Turkish; English s.t. Aykan Safoǧlu Off-White Tulips, 2013 Off-White Tulips is a tribute to the US-American writer James Baldwin. In this dense video essay, the artist links Baldwin’s self-imposed exile in Turkey with his own biographical details and an exploration of his native country. With the help of old photographs, we follow the path through Istanbul equally of James Baldwin as much as of Aykan Safoǧlu and his family. The emphasis on both personal stories quickly begins to blur fact and fiction. Safoǧlu calls this form biomythography – a type of invented life story coined by the American writer and activist Audre Lord, who described herself as a ‘black lesbian feminist mother warrior poet’. Off-White Tulips looks at history from marginal perspectives in order to explore alternative interpretations of cultural artefacts and differences, queer politics and identity. It is concerned with black survival strategies in a white mainstream. The film was awarded the Oberhausen Grand Prize at the Short Film Festival in Oberhausen in 2013. Aykan Safoğlu Aykan Safoğlu is an artist and short film maker Ausklappen...	Aykan Safoğlu is an artist and short film maker based in Berlin. After graduating from Istanbul Bilgi University, where he studied film, he completed his master′s degree in "Art in Context" at the University of the Arts Berlin in 2010. He also completed his MFA in Photography at Bard College in New York in 2013. Since 2005, Safoğlu has made several short films, published articles and reviews in various magazines. He has participated in many group exhibitions and curated them. In 2013, he received the Grand Prize of the City of Oberhausen in the 59th international Short Film Festival Oberhausen for his short film "Kırık Beyaz Laleler / Off-White Tulips." Safoğlu was awarded a 2014 residency at the Rijksakademie van beeldende kunsten in Amsterdam. He is a member of the curatorial collective “ğ” (soft g). Aykan Safoğlu: Off-White Tulips (Kırık Beyaz Laleler), 2013, HD, Farbe, 24´, Türkisch; Englisch s.t. Aykan Safoǧlu Off-White Tulips, 2013 Off-White Tulips ist ein Homage an den amerikanischen Autor James Baldwin. In einem dichten Videoessay verbindet der Künstler Baldwinds selbstauferlegtes Exil in der Türkei mit Details aus seiner eigenen Biografie und einem Blick auf sein Heimatland. Mithilfe alter Fotografien folgen wir James Baldwin und Aykan Safoǧlu und dessen Familie gleichermaßen durch Istanbul. Der Fokus auf die persönlichen Geschichten von beiden lässt Fakt und Fiktion schnell verschwimmen. Safoǧlu nennt diese Form Biomythografie – eine Form der fiktiven Lebensgeschichte, begründet von der amerikanischen Autorin Audre Lord, die sich selbst als “black lesbian feminist mother warrior poet” bezeichnet. Off-White Tulips blickt aus marginalisierten Perspektiven auf die Geschichte um daraus alternative Interpretationen kultureller Artefakte und Differenzen sowie von Queer Politik und Identität zu ziehen. Das Werk befasst sich mit schwarzen Überlebensstrategien innerhalb eines weißen Mainstreams. Der Film wurde mit dem Oberhausen Grand Prix beim Kurzfilm-Festival 2013 in Oberhausen ausgezeichnet. Aykan Safoğlu Aykan Safoğlu ist Künstler und Kurzfilmer Ausklappen...	Aykan Safoğlu ist Künstler und Kurzfilmer. Er studierte Film an der Istanbul Bilgi Universität und schloss 2010 den Masterstudiengang Kunst im Kontext an der Universität der Künste ab. Es folgte ein MFA Abschluss in Fotografie am Bard College in New York im Jahr 2013. Seit 2005, hat Safoğlu mehrere Kurzfilme realisiert, und in verschiedenen Magazinen Artikel und Essays veröffentlicht. Er hat an zahlreichen Gruppenausstellungen teilgenommen und ebenso kuratiert. 2013 erhielt er den Großen Preis der 59. Internationalen Kurzfilmtage Oberhausen für seinen Kurzfilm "Kırık Beyaz Laleler / Off-White Tulips". 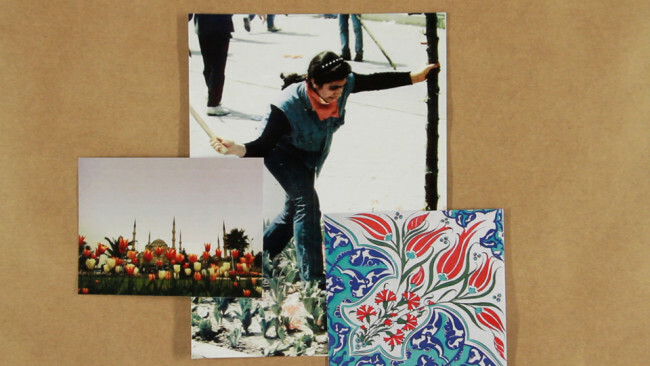 Safoğlu wurde 2014 mit einem Stipendium der Rijksakademie in Amsterdam ausgezeichnet. He ist Mitglied des Kuratornkollektives “ğ” (soft g). 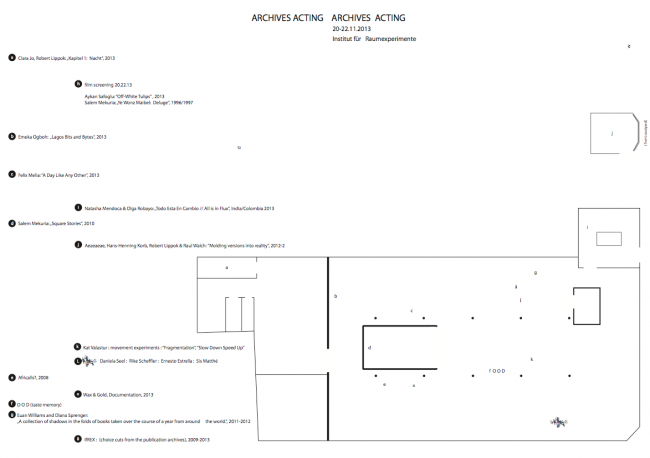 Archives Acting is an exhibition curated on occasion of the Archives Works Marathon and hosted at the Institut für Raumexperimente and the Grey Sheep project housed at Studio Olafur Eliasson. Archives Acting is choreographed by Eric Ellingsen and Christina Werner with contributions by Aeaeaeae, Hans-Henning Korb, Robert Lippok, and Raul Walch; Clara Jo and Robert Lippok; Salem Mekuria; Felix Melia; Natasha Mendonca and Olga Robayo; Netsa Art Village, Mihret Kebede, and Robel Temesgen; Emeka Ogboh; Elvira Dyangani Ose and Pere Ortín; Aykan Safoǧlu; Daniela Seel, Rike Scheffler, Ernesto Estrella, and Sis Matthé; Diana Sprenger and Euan Williams; and Kat Válastur. Aeaeaeae, Hans-Henning Korb, Robert Lippok, and Raul Walch Molding Versions into Reality, 2012-2013 Everything is knot together here. Everything hanging here comes from Ethiopia, even the things that come from China, and this is reality. This is the sound of reality snared and knotted together from stories and streets and markets and roundabouts in Addis Ababa. This is archive’s opposite, a moment of chaotic similarities. A sound installation as part of the Grey Sheep project. Tainá Guedes, Asako Iwama, Lauren Maurer, and Lynn Peemoeller f : O O D, 2013 Served in the context of the marathon days, these taste memory experiments, recipes, menus, and thoughts are provided by Tainá Guedes, Asako Iwama, Lauren Maurer, and Lynn Peemoeller. Menu designed by Thomas Meyer. Clara Jo and Robert Lippok 24h Dahlem, Kapitel 1: Nacht, 2013 24h Dahlem centres on the controversial re-location of the ethnographic collections of the Dahlem Museums to the future site of the Humboldt Forum in Berlin’s city centre. Combining material from two archives within the Ethnological Museum and the Museum for Asian Art, the resulting large-scale video installations are presented in three chapters in the Dahlem Museum. 24h Dahlem was produced in the context of the Humboldt Lab Dahlem, a project of the German Federal Cultural Foundation and the Prussian Cultural Heritage Foundation. Director: Clara Jo; sound design & audio archive composition: Robert Lippok; director of photography: Michael Laakmann Felix Melia A Day Like Any Other, 2013 A Day Like Any Other is a video work comprised of appropriated video and audio from the Aquis Bryant film Hood 2 Hood: The Blockumentary and Samuel Beckett’s Endgame. The video draws a comparison between the repetitive, cyclical nature of events in Beckett’s play and the similarly recurrent explanations and stories of ‘real’ life in Hood 2 Hood, stories that allude to the sedentary metaphysics and social immobility imposed upon its protagonists. The words ‘all day everyday’ literally encircle the imagery of the work. A commonly employed assertion within the appropriated footage, these words describe a refusal to give in, while highlighting the limited dynamic of the environments the protagonists inhabit. Salem Mekuria Ye Wonz Maibel: Deluge, 1996/1997 Ye Wonz Maibel: Deluge is a personal visual meditation on history, conflict, and the roads to reconciliation. It is a tale of love and betrayal, of idealism and the lure of power. It is a memorial to a brother who disappeared and a best friend, executed. It is a story of the Ethiopian students, their ‘revolution’, and its aftermath – a brutal military dictatorship. Ye Wonz Maibel: Deluge contemplates the role of the individual in perpetuating national tragedies – be that famine, war, or political terror – by re-visiting family tragedies in Ethiopia. Focusing on and searching through her own history, Mekuria sought personal experiences that illuminated universal truths. The film offers tools for reflection in order to look forward to a future in which responsibility and choice inform our conduct. Salem Mekuria Square Stories, 2010 Square Stories is a triptych video installation. Maskal Square (Revolution Square, or just ‘the Square’), located in the centre of Addis Ababa, Ethiopia, is a massive concrete expanse framed by permanent bleachers. It is the lowest point in the city: everything cascades into the Square. Everything big that happens in the city takes place there. The Square is also a site of commemoration, anchored by two museums that offer stable, corporealised narratives of the city and the nation. Square Stories offers a way of bearing witness to these multiple, fragmentary histories. It presents Maskal Square both as place and metaphor culled from a childhood in Addis Ababa and the gaze of an American art professor. The triptych format, which gestures to Ethiopia’s religious and cultural history, amplifies the contradictions within history, memory, and narration and interrogates the failure of any one story to stand in for the manifold subjectivities that comprise Ethiopian identity and history. Writer/producer/videographer/director: Salem Mekuria; editor: Sarah B. Peck Natasha Mendoca & Olga Robayo Todo Esta En Cambio // All is in Flux, 2013 Todo Esta En Cambio navigates through sounds that seamlessly crisscross India and Colombia. This sonic journey takes us through the agrarian crisis and the consequences of the free trade treaty signed between India, Colombia, and the United States. The sound makes links between how food is produced in an industrialised world without consideration for the farmers, and how political leaders and corporations are leading the world to further environmental and socio-political disasters in the name of profit. Netsa Art Village Wax&Gold, 2013 Wax&Gold is a documentation of the Wax&Gold workshop for freedom of artistic expression that took place at Netsa Art Village and was accompanied by a touring exhibition in Addis Ababa, July 2012. Wax&Gold, a project developed and designed by Netsa Art Village and funded by the Prince Claus Fund, embraces the historical Ethiopian tradition of ‘Wax and Gold’, an approach involving indirect methods of communication, a strong form of expression in Ethiopian literature called ‘Qinie’, which obscures and protects the main message, the ‘Gold’, by covering it with ‘Wax’. Presented by Mihret Kebede & Robel Temesgen. Emeka Ogboh Lagos Bits and Bytes, 2013 An electro-acoustic exploration of a bustling amphitheatre of sounds, a sprawling metropolis, and an aspiring megalopolis – Lagos, Nigeria. This is an excerpt from a Lagos soundscapes project, an acoustic enquiry into the mega-city focused on capturing sounds that define the unique character of Lagos and reflect the city’s diversity. Elvira Dyangani Ose & Pere Ortín Africalls?, 2008 Africalls? is a documentary film that shows the work of five artists and two production centres of contemporary art in seven African cities. It shows the interests that motivate them and the urban context from which they create their artworks. Africalls? approaches these artists’ work from an unusual perspective, exploring their personalities and creative processes as well as the art objects they make in Dakar, Douala, Cape Town, Rabat, Luanda, Nairobi, and Maputo. Africalls? is an audiovisual journey through the contemporary art of an urban Africa: both cosmopolitan and little-known, local and global. Curator: Elvira Dyangani Ose; director: Pere Ortín; producer: Vic Pereiró Aykan Safoǧlu Off-White Tulips, 2013 Off-White Tulips is a tribute to the US-American writer James Baldwin. In this dense video essay, the artist links Baldwin’s self-imposed exile in Turkey with his own biographical details and an exploration of his native country. With the help of old photographs, we follow the path through Istanbul equally of James Baldwin as much as of Aykan Safoǧlu and his family. The emphasis on both personal stories quickly begins to blur fact and fiction. Safoǧlu calls this form biomythography – a type of invented life story coined by the American writer and activist Audre Lord, who described herself as a ‘black lesbian feminist mother warrior poet’. Off-White Tulips looks at history from marginal perspectives in order to explore alternative interpretations of cultural artefacts and differences, queer politics and identity. It is concerned with black survival strategies in a white mainstream. The film was awarded the Oberhausen Grand Prize at the Short Film Festival in Oberhausen in 2013. Daniela Seel, Rike Scheffler, Ernesto Estrella, and Sis Matthé L-A-N-G-U-A-G-I-N-G, 2013 L-A-N-G-U-A-G-I-N-G is a series of writing experiments and spontaneous language swerves informed by a space of listening. For two days, four poets tweeted echoes of what they heard from a listening space in the context of the Archives Works Marathon. The tweets can be found under the Twitter handle @Raumexperimente. Diana Sprenger and Euan Williams A Collection of Shadows in the Folds of Books Taken over the Course of a Year from Around the World, 2011-2012 In the folds of books. Reproduced shadows. Heightening the ephemeral quality of a book as a physical entity. A movable and borderless publication. Free of obvious geographical and temporal marks, yet created out of the temporal and geographical relationship between a source of light, an object, and the moment in which a photo is taken. A merging of real shadows with represented ones. Past mixes with present, as northern hemisphere mixes with southern hemisphere. Kat Válastur Fragmentation, Slow Down, Speed Up (Sketches), 2013 Movement experiments developed and demonstrated by the artist to collectively test moving in and against time Institut für Raumexperimente A presentation of selected visual material from the archives of the Institut für Raumexperimente, 2009-2013. Archives Acting ist eine Ausstellung, die anlässlich des Archives Works Marathons kuratiert wurde und im Institut für Raumexperiemente sowie dem Grey Sheep Projekt im Studio Olafur Eliasson gezeigt wird. Archives Acting wurde von Eric Ellingsen und Christina Werner choreografiert und zeigt Beiträge von Aeaeaeae, Hans-Henning Korb, Robert Lippok, und Raul Walch; Clara Jo und Robert Lippok; Salem Mekuria; Felix Melia; Natasha Mendonca und Olga Robayo; Netsa Art Village, Mihret Kebede und Robel Temesgen; Emeka Ogboh; Elvira Dyangani Ose und Pere Ortín; Aykan Safoǧlu; Daniela Seel, Rike Scheffler, Ernesto Estrella und Sis Matthé; Diana Sprenger und Euan Williams sowie Kat Válastur. Aeaeaeae, Hans-Henning Korb, Robert Lippok und Raul Walch Molding versions into reality, 2012-2013 Alles hier ist miteinander verknotet. Alles was hier hängt kommt aus Äthiopien, sogar die Dinge die aus China kommen und das ist die Realität. Das ist der Klang der Realität, eingefangen und zusammengeknotet aus Geschichten und Straßen und Märkten und Kreisverkehren in Addis Abeba. Das ist das Gegenteil des Archivs, ein Moment chaotischer Ähnlichkeiten. Eine Klanginstallation als Teil des Grey Sheep Projektes. Tainá Guedes, Asako Iwama, Lauren Maurer und Lynn Peemoeller f : O O D, 2013 Diese leckeren Erinnerungsexperimente, Rezepte, Menüs und Ideen werden im Rahmen der Marathon-Tage von Tainá Guedes, Asako Iwama, Lauren Maurer und Lynn Peemoeller aufgetischt. Entwurf des Menüs von Thomas Meyer. Clara Jo und Robert Lippok 24h Dahlem, Kapitel 1: Nacht, 2013 24h Dahlem positioniert sich rund um die kontroverse Umsiedelung der ethnografischen Sammlung aus den Museen Dahlem an ihren zukünftigen Ort, das Humboldt Forum im Stadtzentrum Berlins. Mit einer Mischung aus Materialien zweier Archive des Ethnologischen Museums und des Museums für Asiatische Kunst werden die daraus entstandenen großformatigen Videoinstallationen in drei Kapiteln in den Museen Dahlem gezeigt. 24h Dahlem wurde im Rahmen des Humboldt Lab Dahlem produziert, einem Projekt der Kulturstiftung des Bundes und der Stiftung Preußischer Kulturbesitz. Regie: Clara Jo; Sounddesign & und Komposition der Audioarchive: Robert Lippok; Kamera: Michael Laakmann Felix Melia A Day Like Any Other, 2013 A Day Like Any Other verwendet Video- und Audiomaterial des Films Hood 2 Hood: The Blockumentary von Aquis Bryant und Samuel Becketts Endspiel. Das Video zieht einen Vergleich zwischen der sich wiederholenden, zyklischen Struktur der Ereignisse in Becketts Stück und den genauso repetitiven Erklärungen und Geschichten des „echten“ Lebens in Hood 2 Hood. Dies sind Geschichten, welche auf die immobile Metaphysik und soziale Unbeweglichkeit hinweisen, welche den Protagonisten auferlegt sind. Die Formulierung „den ganzen Tag, jeden Tag“ umschreibt wortwörtlich die Bildwelten dieses Werks. Als wiederholte Beteuerung innerhalb der appropriierten Filmelemente steht diese Formulierung für Weigerung nachzugeben während sie gleichzeitig die eingeschränkte Dynamik der Umgebung, in der die Protagonisten sich befinden, herausstellt. Salem Mekuria Ye Wonz Maibel: Deluge, 1996/1997 Ye Wonz Maibel: Deluge ist eine persönliche, visuelle Meditation über Geschichte, Konflikten und Wegen, die zur Versöhnung führen. Es ist eine Geschichte über Liebe und Betrug, Idealismus und die Verführung der Macht. Es ist ein Denkmal an einen Bruder der verschwand und einen besten Freund der exekutiert wird. Erzählt wird die Geschichte der äthiopischen Studenten, ihrer „Revolution“ und dem was darauf folgt – eine brutale Militärdiktatur. Ye Wonz Maibel: Deluge denkt über die Rolle des Individuums in bestehenden nationalen Tragödien nach – das können Hungersnöte, Kriege oder politischer Terror sein – indem Familientragödien in Äthiopien neu betrachtet werden. Mit suchendem Fokus auf ihre eigene Geschichte greift Mekuria, persönliche Erfahrungen auf, die universelle Wahrheiten aufscheinen lassen. Salem Mekuria Square Stories, 2010 Square Stories ist eine Videoinstallation im Tryptichon-Format. Der Maskal Square Platz (Revolution Square oder einfach auch “the square”) liegt im Zentrum von Addis Abeba, Äthiopien, und ist eine große Betonfreifläche, die von fest installierten Tribünen begrenzt ist. Der Platz ist der niedrigstgelegene Punkt der Stadt: Alles läuft auf den Square zu. Alle großen Ereignisse in der Stadt finden hier statt. Der Platz ist auch ein Ort für Erinnerung. Zwei Museen, die hier Orientierungspunkte bieten stehen für konstante, verkörperte Narrationen der Stadt sowie der Nation. Square Stories bietet einen Zugang, um Zeugnis für diese vielseitigen, fragmentierten Geschichten abzulegen. Der Maskal Square wird sowohl als Platz als auch als Metapher präsentiert. Das Triptychon-Format, das der religiösen und kulturellen Geschichte Äthiopiens entlehnt ist, unterstreicht die Widersprüchlichkeit, die der Geschichte, der Erinnerung und der Narration zugrunde liegen. Gleichzeitig unterstreicht es, dass seither keine einzelne Geschichte repräsentativ für die vielseitigen Subjektivitäten, aus denen die äthiopische Identität und Geschichte bestehen, einstehen konnte. Autor/Produzent/Kamera/Regie: Salem Mekuria; Schnitt: Sarah B. Peck Natasha Mendoca & Olga Robayo Todo Esta En Cambio // All is in Flux, 2013 Todo Esta En Cambio navigiert durch Klänge, die Indien und Columbien nahtlos im Zickzack durchqueren. Diese Klangreise nimmt uns mit durch eine Landwirtschaftskrise und deren Auswirkungen auf das freie Handelsabkommen zwischen Indien, Kolumbien und den Vereinigten Staaten. Der Klang stellt Verbindungen zwischen der Nahrungsmittelproduktion in einer industrialisierten Welt her, wo Bauern nicht mit in Betracht gezogen werden, und der Art, auf die Politiker und Firmen im Namen des Profits die Welt in weitere umwelttechnische und sozio-politische Desaster führen. Netsa Art Village Wax&Gold, 2013 Wax&Gold ist eine Dokumentation des Wax&Gold Workshops für die Freiheit künstlerischen Ausdrucks, der im Netsa Art Village stattfand und von einer Wanderausstellung in Addis Abeba im Juli 2012 begleitet wurde. Wax&Gold, ein Projekt das vom Netsa Art Village entwickelt und gestaltet wurde, sowie vom Prince Claus Fonds mitgetragen wird, übernimmt die historische äthiopische Tradition des “Wax & Gold”. Dieser Ansatz umfasst indirekte Kommunikationsformen, eine in der äthiopischen Literatur starken Ausdrucksform namens “Qinie”, welche die zu transportierende Aussage gleichermaßen verschleiert als auch schützt. Das “Gold” wird hier mit “Wachs” überzogen. Präsentiert von Mihret Kebede & Robel Temesgen. Emeka Ogboh Lagos Bits and Bytes, 2013 Ein elektroakustischer Erkundungsgang durch ein klangerfülltes Theater, eine lebendige Metropole und eine aufstrebende Megalopole – Lagos in Nigeria. Dies ist ein Ausschnitt aus einem Projekt, das mit den Klanglandschaften Lagos arbeitet und eine akustische Befragung der Megastadt ist. Der Fokus liegt dabei darauf, Klänge einzufangen, die den einzigartigen Charakter der Stadt Lagos bestimmen und die Diversität der Stadt widerspiegeln. Elvira Dyangani Ose & Pere Ortín Africalls?, 2008 Africalls? ist ein Dokumentationsfilm, der die Arbeit von fünf Künstlern und zwei Produktionszentren für zeitgenössische Kunst in sieben afrikanischen Städten zeigt. Africalls? thematisiert die Arbeiten dieser Künstler aus einer ungewöhnlichen Perspektive, zeigt ihre Persönlichkeiten und Kreativprozesse sowie Kunstwerke, die sie in Dakar, Douala, Kapstadt, Rabat, Luanda, Nairobi und Maputo schaffen. Africalls? ist eine audiovisuelle Reise durch die zeitgenössische Kunst eines urbanen Afrikas: Kosmopolitisch und wenig bekannt, lokal und global. Kurator: Elvira Dyangani Ose; Regisseur: Pere Ortín; Produktion: Vic Pereiró Aykan Safoǧlu Off-White Tulips, 2013 Off-White Tulips ist ein Homage an den amerikanischen Autor James Baldwin. In einem dichten Videoessay verbindet der Künstler Baldwinds selbstauferlegtes Exil in der Türkei mit Details aus seiner eigenen Biografie und einem Blick auf sein Heimatland. Mithilfe alter Fotografien folgen wir James Baldwin und Aykan Safoǧlu und dessen Familie gleichermaßen durch Istanbul. Der Fokus auf die persönlichen Geschichten von beiden lässt Fakt und Fiktion schnell verschwimmen. Safoǧlu nennt diese Form Biomythografie – eine Form der fiktiven Lebensgeschichte, begründet von der amerikanischen Autorin Audre Lord, die sich selbst als “black lesbian feminist mother warrior poet” bezeichnet. Off-White Tulips blickt aus marginalisierten Perspektiven auf die Geschichte um daraus alternative Interpretationen kultureller Artefakte und Differenzen sowie von Queer Politik und Identität zu ziehen. Das Werk befasst sich mit schwarzen Überlebensstrategien innerhalb eines weißen Mainstreams. Der Film wurde mit dem Oberhausen Grand Prix beim Kurzfilm-Festival 2013 in Oberhausen ausgezeichnet. Daniela Seel, Rike Scheffler, Ernesto Estrella, und Sis Matthé L-A-N-G-U-A-G-I-N-G, 2013 L-A-N-G-U-A-G-I-N-G ist eine Serie aus Schreibexperimenten und spontanen Sprachnotizen, beeinflusst von einem “Zuhörort”. Zwei Tage lang tweeteten vier Dichter Echos dessen was sie an diesem Ort im Rahmen des Archives Works Marathon hörten. Ihre Tweets finden sich bei Twitter unter @Raumexperimente. Diana Sprenger und Euan Williams A Collection of Shadows in the Folds of Books Taken over the Course of a Year from Around the World, 2011-2012 Zwischen den Falten von Buchseiten. Reproduzierte Schatten. Eine Unterstreichung der flüchtigen Eigenschaften von Büchern als physischer Einheit. Eine bewegliche und grenzenlose Publikation. Frei von offensichtlichen geografischen und zeitlichen Zeichen und doch aus der zeitlichen und geografischen Beziehung zwischen einer Lichtquelle, einem Objekt und dem Moment des Fotografierens entstanden. Eine Vermischung von echten Schatten mit den repräsentierten Schatten. Die Vergangenheit vermischt sich mit der Gegenwart genauso wie sich die nördliche Hemisphäre mit der südlichen Hemisphäre vermischt. Kat Válastur Fragmentation, Slow Down, Speed Up (Entwürfe), 2013 Experimente zu Bewegung, die von der Künstlerin entwickelt und vorgeführt wurden um kollektiv Bewegung in und gegen die Zeit zu testen. Institut für Raumexperimente Präsentation von ausgewählten Bild- und Publikationsmaterialien aus dem Institutsarchiv von 2009-2013.